In the sequence of green arrows, a pair of ultracold gas atoms collides, briefly forms a molecule, and flies apart, in the presence of an external magnetic field (not shown) that influences this process. By adding RF radiation (lightning bolts) of the right frequency, the atoms can experience being in many different molecular states (red arrows), providing even more extensive and detailed control of the collision. The size of the yellow bursts indicate the amount of absorption/emission of RF radiation. Investigating mysterious data in ultracold gases of rubidium atoms, scientists at the Joint Quantum Institute and collaborators have found that properly tuned radio-frequency waves can influence how much the atoms attract or repel one another, opening up new ways to control their interactions. As the authors report* in an upcoming issue of Physical Review A, the radio-frequency (RF) radiation could serve as a second "knob," in addition to the more traditionally used magnetic fields, for controlling how atoms in an ultracold gas interact. Just as it is easier to improve reception on a home radio by both electronically tuning the frequency on the receiver and mechanically moving the antenna, having two independent knobs for influencing the interactions in atomic gases could produce richer and more exotic arrangements of ultracold atoms than ever before. Previous experiments with ultracold gases, including the creation of Bose-Einstein condensates, have controlled atoms by using a single knob—traditionally, magnetic fields. These fields can tune atoms to interact strongly or weakly with their neighbors, pair up into molecules, or even switch the interactions from attractive to repulsive. Adding a second control makes it possible to independently tune the interactions between atoms in different states or even between different types of atoms. Such greater control could lead to even more exotic states of matter. 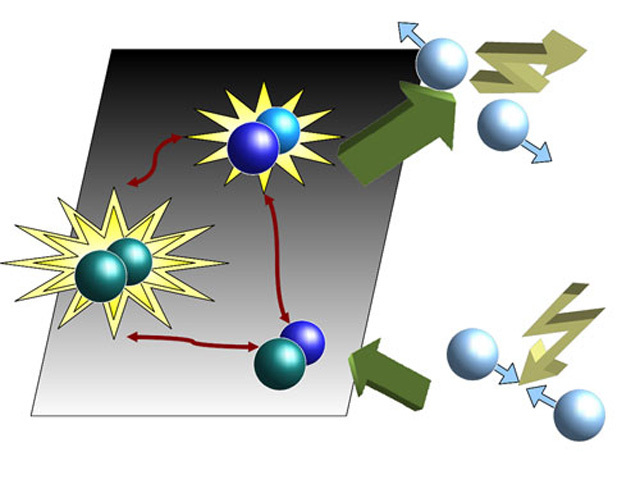 A second knob, for example, may make it easier to create a weird three-atom arrangement known as an Efimov state, whereby two neutral atoms that ordinarily do not interact strongly with one another join together with a third atom under the right conditions. For many years, researchers had hoped to use RF radiation as a second knob for atoms, but were limited by the high power required. The new work shows that, near magnetic field values that have a big effect on the interactions, significantly less RF power is required, and useful control is possible. In the new work, the JQI/NIST team examined intriguing experimental data of trapped rubidium atoms taken by the group of David Hall at Amherst College in Massachusetts. This data showed that the RF radiation was an important factor in tuning the atomic collisions. To explain the complicated way in which the collisions varied with RF frequency and magnetic field, NIST theorist Thomas Hanna developed a simple model of the experimental arrangement. The model reconstructed the energy landscape of the rubidium atoms and explained how RF radiation was changing the atoms' interactions with one another. In addition to providing a roadmap for rubidium, this simplified theoretical approach could reveal how to use RF to control ultracold gases consisting of other atomic elements, Hanna says.